Airport Chaplaincy -- A Catholic Handbook on sale now! In 2002, Catholic airport chaplains from around the world gathered with Pope St. John Paul II for this photo. Fr. Zaniolo, Fr. Wanda (Associate Chaplain at Midway) can be seen in the front row on the right, and Deacon and Mrs. Trevino are standing just behind the Holy Father. Fr. Michael Zaniolo, Deacon Jim O'Malley, and Deacon and Mrs. Luis Trevino participated in the XII International Seminar for Catholic Civil Aviation Chaplains and Chaplaincy Members Apr. 19-24, 2005, in Rome, at the same time as the papal conclave. 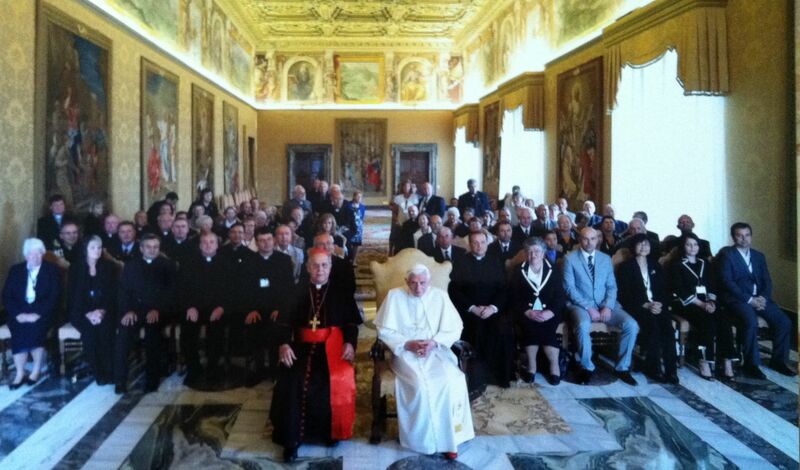 In April 2007, Catholic airport chaplains from around the world gathered for the XIII World Seminar at the Vatican. Fr. Zaniolo, President of the National Conference Of Catholic Airport Chaplains, personally greets His Holiness Pope Benedict XVI. The Pope conveyed his high regard for the work of airport chaplains and extended his blessing to all the airport workers and their families throughout the world. On June 11, 2012, 90 Catholic airport chaplains from 15 nations gathered for the XV World Seminar in Rome. Forty Chaplains and chaplaincy team members from the United States attended and were present for a private audience with Pope Benedict XVI.